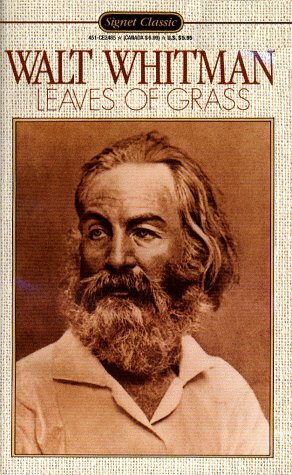 Leaves of Grass (1855) is a poetry collection by the American poet Walt Whitman. Among the poems in the collection are "Song of Myself," "I Sing the Body Electric," and in later editions, Whitman's elegy to the assassinated President Abraham Lincoln, "When Lilacs Last in the Dooryard Bloom'd." Whitman spent his entire life writing Leaves of Grass, revising it in several editions until his death. Leaves of Grass has its genesis in an essay called The Poet by Ralph Waldo Emerson, published in 1845, which expressed the need for the United States to have its own new and unique poet to write about the new country's virtues and vices. Whitman, reading the essay, consciously set out to answer Emerson's call as he began work on the first edition of Leaves of Grass. Whitman, however, downplayed Emerson's influence, stating, "I was simmering, simmering, simmering; Emerson brought me to a boil". On May 15, 1855, Whitman registered the title Leaves of Grass with the clerk of the United States District Court, Southern District of New Jersey, and received its copyright. The first edition was published in Brooklyn at the Fulton Street printing shop of two Scottish immigrants, James and Andrew Rome, whom Whitman had known since the 1840s, on July 4, 1855. Whitman paid for and did much of the typesetting for the first edition himself. The book did not include the author's name, instead offering an engraving by Samuel Hollyer depicting the poet in work clothes and a jaunty hat, arms at his side. Early advertisements for the first edition appealed to "lovers of literary curiosities" as an oddity. Sales on the book were few but Whitman was not discouraged. The first edition was very small, collecting only twelve unnamed poems in 95 pages. Whitman once said he intended the book to be small enough to be carried in a pocket. "That would tend to induce people to take me along with them and read me in the open air: I am nearly always successful with the reader in the open air. "About 800 were printed, though only 200 were bound in its trademark green cloth cover. The only American library known to have purchased a copy of the first edition was in Philadelphia. The poems of the first edition, which were given titles in later issues, were "Song of Myself," "A Song For Occupations," "To Think of Time," "The Sleepers," "I Sing the Body Electric," "Faces," "Song of the Answerer," "Europe: The 72d and 73d Years of These States," "A Boston Ballad," "There Was a Child Went Forth," "Who Learns My Lesson Complete? ", and "Great Are the Myths." The title Leaves of Grass was a pun. "Grass" was a term given by publishers to works of minor value and "leaves" is another name for the pages on which they were printed. Whitman sent a copy of the first edition of Leaves of Grass to Emerson, the man who had inspired its creation. In a letter to Whitman, Emerson said "I find it the most extraordinary piece of wit and wisdom America has yet contributed." He went on, "I am very happy in reading it, as great power makes us happy."